... He was the third NCAA goaltender to be selected, after Boston University’s Jake Oettinger (first round) and Quinnipiac University commit Keith Petruzzeli (third round). The selection of Swayman by the Bruins gives UMaine five NHL draft picks on its roster next fall. Chase Pearson and Pat Holway (Detroit), Pat Shea (Florida) and Nolan Vesey (Toronto) are the others. Swayman is one of eight players who will start their UMaine careers this fall. Swayman will join goaltenders Rob McGovern and Stephen Mundinger. The following current, former and future college players are taking part in NHL Development Camps in the summer of 2017 as announced by the NHL or NCAA team. Updated June 26, 2017, with updates to come as they are announced. NYI	Steve	Mundinger	G	Maine	Free Agent	So. FLA	Patrick	Shea	F	Maine	Draft	So. LA	Brady	Keeper	D	Maine	Free Agent	Fr. In addition to helping the Kings this season, Kawamura will use his time in Powell River to ready himself for the NCAA. Kawamura is slated to join the University of Maine for the 2018/2019 season. BRIGHTON, Mass. - The Boston Bruins have invited 29 players to attend their 2017 Developmental Camp, and a key piece to the University of Maine men's hockey team is one of them. McGovern, an undrafted free agent, carries a bit of experience with him into camp. He attended the Blackhawks’ camp for prospects on an invitation basis last summer. McGovern won’t be the only Black Bear goalie in camp. Maine-bound Jeremy Swayman, the Bruin’s fourth-round choice (No. 111 overall) in last month’s NHL Entry Draft, will also attend. Black Bears netminder Rob McGovern is going to be at Bruins Development Camp after receiving an invitation. 3. Incoming University of Maine goaltender Jeremy Swayman really looked good in his first day on the ice with the Bruins organization. He obviously has good size at 6-3 and looks the part in goalie equipment, but he also looked athletic and very steady tracking the puck in the drills as one of just two goalies on the ice. Swayman wasn’t beaten cleanly by many shots and showed good competitiveness battling to keep everything out of the net when the puck got close to him. It’s always a challenge for goaltenders to stand out in development camps full of offensive prospects, but Swayman looked like the real deal in his first go-through prior to jumping in with the Black Bears. 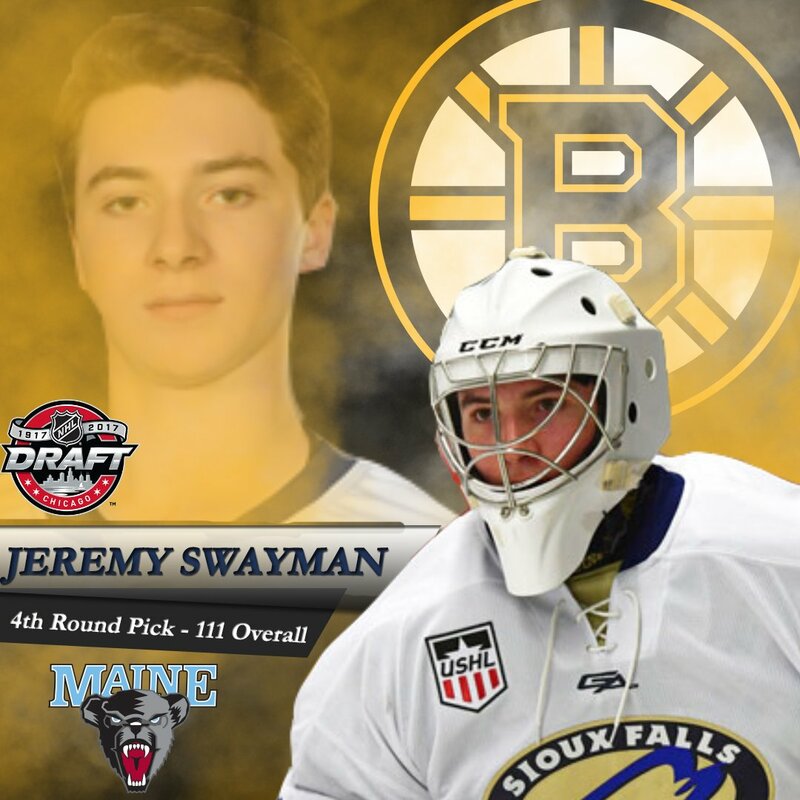 Goalie Jeremy Swayman, the B’s fourth-round pick (111th overall) last month, will be playing for the University of Maine in the fall, attracted to the school that’s produced Ben Bishop, Jimmy Howard and Garth Snow. ...Heading into next season, there is optimism in Orono, and it is due in part to McGovern’s play. For the Bruins to take notice, something is going right for the Weymouth native. Unlike some of the younger goalies in camp, such as USHL player and draft pick Jeremy Swayman, or Walpole, Mass. high school graduate James Corcoran, McGovern was used to facing the talent level he saw, facing up against Bruins prospect Anders Bjork of Notre Dame regularly. That mindset is looking to lead the Black Bears next season.